White asparagus has a tough, bitter peel that must be removed before cooking. Follow these classic steps in preparing the treasured vegetable in Germany. Bring water, salt, lemon juice, and butter to a simmer in a large pot over medium heat. Trim about 1/2″ from the ends of white asparagus and peel the thin skin from each with a vegetable peeler. Place the peeled asparagus in small tied bundles, place bundles into bowling water, increase heat to medium-high and cook asparagus until tender about 8-30 min. Remove bundles from water and drain on paper towels. Cook white asparagus as described above. Boil potatoes for about 20 min., arrange the ham on a plate. Pour Hollandaise sauce ingredients in a food processor and run for 90 seconds. Melt butter in a saucepan. Pour melted butter in the processor until sauce thickens. 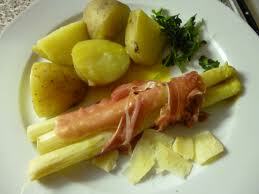 Place the white asparagus and cooked potatoes into a serving plate, pour sauce over the asparagus and serve with ham.